The safest option for horse transit, with a 5 year warranty on our Aussie workmanship for your peace of mind. Check out our range below! The JR is designed with your precious horses safety and comfort as our first priority. What does anti-scramble mean anyway? Horse scrambling happens when a horse doesn't have the room to spread its legs out and balance in a moving trailer. Evidence of a distressed horse can be scrape marks up the side of your straight load plus difficulty in loading, excessive manuring and stamping whilst floating. Evidence: Your horse is anxious, sweaty, nervous, fearful and is consistently shuffling its legs and 'sweating up' as it tries its hardest to stay upright. Our JR horse floats were designed by John Chatterton and his mate Robert in 1993 to create a safe and comfortable way for horses to travel, and prevent horses from scrambling and falling. "The JR's uniquely have flared walls for horses, giving them extra leg room to get their balance and stabilise during travel. As well as horizontally adjustable chest bars that act like seat belts, to support them to feel safer and travel better. In the larger floats, the sloped tack boxes replicate the sloped walls except you have extra storage." The JR's sloped walls allows 95 cm at the hoof area to spread out. The top of the bay is 70 cm wide which supports the torso of the horse. The chest bars have 5 horizontal settings, so the bay is adjusted to the right size for your horse. The rump bars have 3 height settings and are set just under the dock of the horses tail. Some horses actually rest on this during transit (yes, they get that relaxed)! And by the way, the rump bars are 20 cm from the tailgate, so no tail rub! In an angle, horses often hit their heads on the wall as cars brake and turn corners. In the anti-scramble they have leg room AND plenty of head room to put their withers down. At JR, our patented design puts the safety and comfort of horses first...but don't worry there are plenty of features for you to enjoy a great day or weekend away! All these features can relax your horse and help it to arrive fresh and perform better at events. Even if your horse doesn't scramble, these floats ensure the safest option to travel in. You can choose from a large variety of great optional extras to suit your needs as well. Did we mention that the rump bars are spaced 20 cm away from the tailgate? NO tail rub anymore! The JR Bendigo 2HSL is an open sided float, designed for the hotter areas of Australia. It has set bay sizes and is not adjustable like the rest of the fleet, but has the sloped walls for your horses comfort. The JR Winton 2HSL is an anti-scramble float made to transport your horses safely from A to B, with full anti-scramble adjustments. 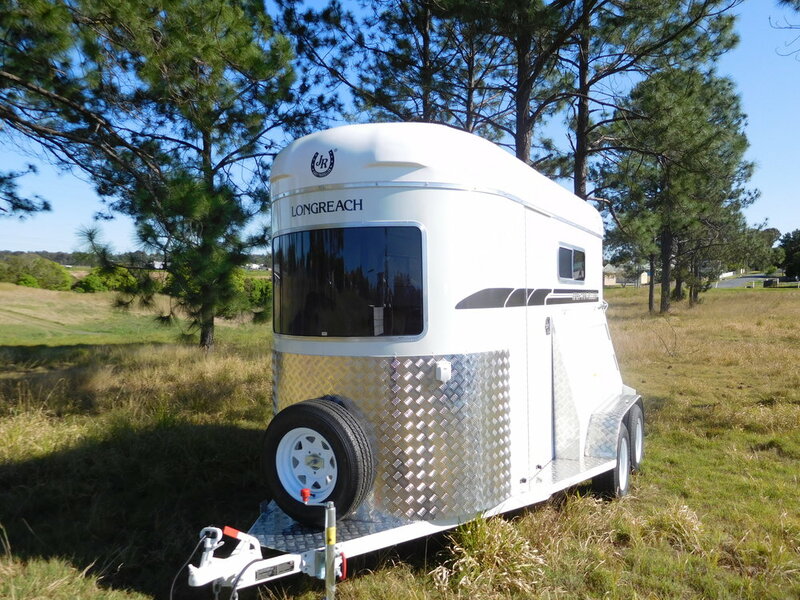 The JR Longreach 2HSL has an extra 32.5cm in length than the Longreach and has a front cupboard included. This one is the most popular anti-scramble float. The JR Condamine 2HSL has a spacious feel and is a longer, higher and wider bodied float with anti-scramble side tack bins giving extra width for horses to stabilise their legs during transit. The JR Cloncurry 2HSL with Living is a large float with a kitchen and bench which folds down quickly to a double bed (available in an angle load also). The JR Cloncurry Gooseneck tows beautifully and is produced custom made to suit your budget and needs. The JR Ballina 2HSL is our front off load float with 3 ramps and all anti-scramble features (We are also able to make a Condamine Front Off Load, which is smaller). We custom build & personalise your float for you (bays can also be widened and lengthened for larger horses as most of our floats are custom built). This is all backed up with great after sales service and re-sale value. Our floats are built to last! If you have any questions at all drop in or call our friendly staff on 07 5546-8727 or send us an email via our contact page.